GM Web Designs Scoresby is a website designer & developer providing professional looking mobile friendly Bootstrap, WordPress & Joomla website designs, search engine optimisation (SEO) and web hosting to small to medium businesses throughout Melbourne and surrounding areas including: Scoresby, Rowville, Knoxfield, Boronia, Wantirna South, Studfield, Bayswater, Ringwood, Ferntree Gully, Croydon, Vermont, Dandenong, Nunawading. With years experience we understand that having a professionally designed website is vital and can make all the difference between being found and not being found in the search returns, hence why all the websites we design include On-page SEO and are coded in accordance with today's standards, resulting in a bug free platform, which in turn enables better rankings. We custom design and create modern looking mobile friendly websites that reflect your brand and will keep your customers coming back. The fast pace of today’s society has seen a dramatic increase in the number of consumers using their mobile phones, tablets and other small devices. As a result the smaller screen sizes makes it extremely difficult to view, read and navigate static ( non-responsive ) websites and in many cases, functionality that works fine on a PC no longer works. These issues will no doubt cause a negative experience for users possibly causing them to go elsewhere. Where your static website may have once ranked high in search engines that will soon longer be the case as according to reports from Google, any website that isn’t responsive ( mobile friendly ) can expect to be penalised in the search returns! 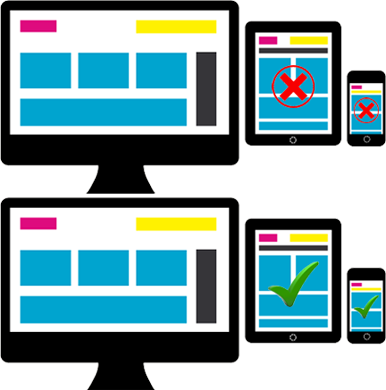 Don’t let your website get penalised in the Search Engine returns for not having a Responsive Website! If you have an existing website and would like to make mobile friendly, then contact us today. Our web designers will either custom build a new design or if preferred create a responsive framework using your existing website as a reference. At GM Web Designs we pride ourselves on our dedication to detail, ongoing customer support and designing unique and great looking web designs at very affordable prices. Our website portfolio is extensive covering different industries including: Engineering, Marine, Finance, Health and Fitness, Industrial, Music and Entertainment, Furniture and Education just to name a few. We prefer not to use Templates, instead our web designers will custom design and build your website so that it not only looks fantastic but will also suit the specific needs of your business at a price that meets your budget. Whether you require Bootstrap, WordPress or Joomla website designs, then we have the solution your business needs. Looking for an E-commerce? Not a problem, we can do that as well. At GM Web Designs, your website will be finished on time every time. All clients are provided with a copy of their completed website and working files. What are you waiting for? Get in touch today.